The inaugural SWSUP Drake’s Island Challenge SUP fun race will take place on Sunday 1st July at 10am. The challenge will follow the Chestnut Appeal Drake’s Island Swim and any profits generated from the event will be donated to the charity. The challenge will take the form of a fun race from our Royal William Yard location at Firestone Bay to Drake’s Island and back. 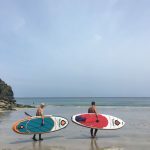 It’s the perfect introduction to SUP racing for all abilities and levels of experience with a distance of 2km. 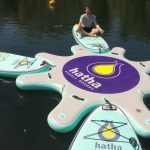 The day will have a lot of other great SUP activities on offer, including: SUP Yoga taster sessions; SUP tug o’war; ‘have a go’ sessions on SWSUP’s XL SUP and the opportunity to demo the full range of Hatha SUP boards. Registration is £25 which includes use of one of our SUPs. We also encourage participants to raise sponsorship to help the Chestnut Appeal provide support for Prostate Cancer patients and their families across Devon and Cornwall. Included: SUP board, paddle and leash.